Japanese food has a reputation for being different and difficult, mainly because that very difference helps to create an illusion of difficulty … it’s a kind of self-perpetuating myth. Japanese cuisine is in many ways so radically different to Western food, and its strangeness is off-putting to some people … after all, this is a food culture that has raw fish at its very heart. I love sashimi, but I can see exactly why lots of people don’t. by Tadashi Ono and Harris Salat, explores the types of food that ordinary Japanese people eat day in, day out. These are the dishes that dominate domestic kitchens and sell out in small diners and hole-in-the-wall restaurants. This is the food that the Japanese really eat. latches onto the current fashion for soul food, which more ordinarily nods towards the American Deep South, and shows that there are similar traditions all over the world, traditions of comfort eating, of family recipes handed down through generations and changed little, of basic dishes that are about more than just feeding the body … big, warming recipes that satisfy the soul. 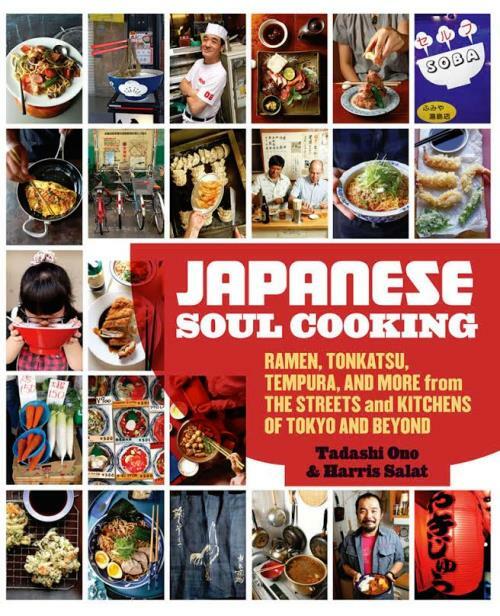 This is a clever collection of Japanese home cooking standards, covering things like big, steaming bowls of ramen noodles, crisp and soft gyoza dumplings, packed with spicy fillings, curries of meat and vegetables, and thick soba and udon noodle dishes. The stars of the show are the deep-fried dishes, the various katsu recipes – things like pork cutlets breaded in fine breadcrumbs and fried, tempura – prawns or vegetables in the lightest batter imaginable, crisp to the touch, or kara-age – seasoned ingredients dredged in potato starch and deep-fried. Nagoya Tebasaki, a dish of chicken wings coated in potato starch and deep-fried before being tossed in a dressing of soy, miso, sake and mirin, then dressed with sesame seeds, disappeared almost immediately I put the bowl of wings down on the table, and was possibly the most delicious chicken dish I’ve made for years – hot, crisp, delicately spiced and crunchy with sesame seeds. includes plenty of recipes just like that, with simple, straightforward and very clear instruction on how to make proper Japanese food. Techniques and processes are also covered in detail where necessary, and there’s plenty of explanation of the food’s context, of where it came from and why it’s important. Above all, this is a book with a clear sense of playfulness and fun. It doesn’t take itself too seriously, but its contents are deadly serious – this is proper Japanese food, presented in a way that will help you to recreate it at home, just don’t get too hung up on the details. Remember that food is something to enjoy. I put this on my wish list when I read your review and finally got it this week. Wish I had bought it sooner! We’ve tried a couple of recipes and they have been excellent. The ramen does take a bit of preparation, but nothing tricky, and the complex flavours are a revelation!